KNIFE Junglee KO2012 Pacific Hunter is a tactical fixed blade knife. Designed for special forces. The knife is made in Seki City, Japan. Unilateral sharpened blades made of stainless steel. Black Teflon coating - AUS8. 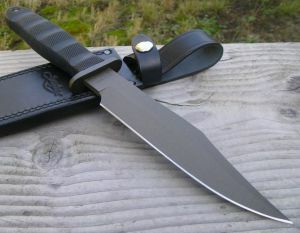 KNIFE Junglee KO2012 Pacific Hunter has a steel blade - AUS8-length 173 mm, length - 300 mm, weight - 252 g , Leather sheath .